I’m very sad to say that #CookoutWeek is over for me. The event officially ends tomorrow, so you’ll still have a variety of great recipes to drool over, but this is the last one for me. This is also the first time that I didn’t make a dessert for #CookoutWeek. I thought about it, but I have a bunch of other sweet recipes coming up in the next few weeks that I thought I could give myself (and my husband’s sweet tooth) a pass for this event. Much like foil packets, skewers (or kebabs) are another one of my favorite ways to grill up food. Once they’re prepared you only need a plate to get them to the grill and a serving plate once they’re done. Recipes that use minimal dishes are totally my thing. 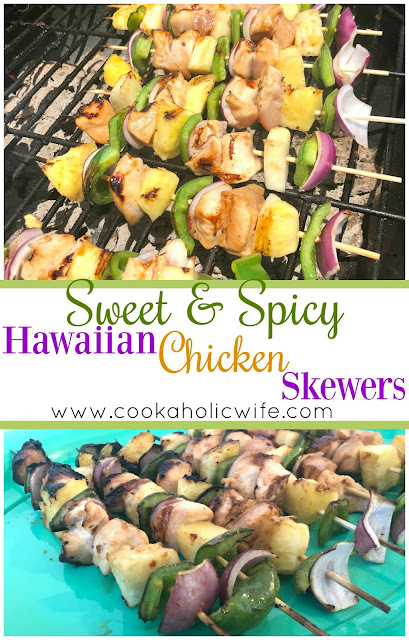 The chicken on these skewers is marinated in a sweet and spicy sauce that includes pineapple juice, brown sugar, Sriracha and crushed red pepper flakes as just a few of the ingredients. 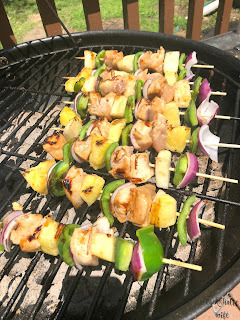 Only half of the marinate goes over the chicken and the remaining half is brushed over the skewers while they’re cooking to add additional flavor to the veggies and pineapple. 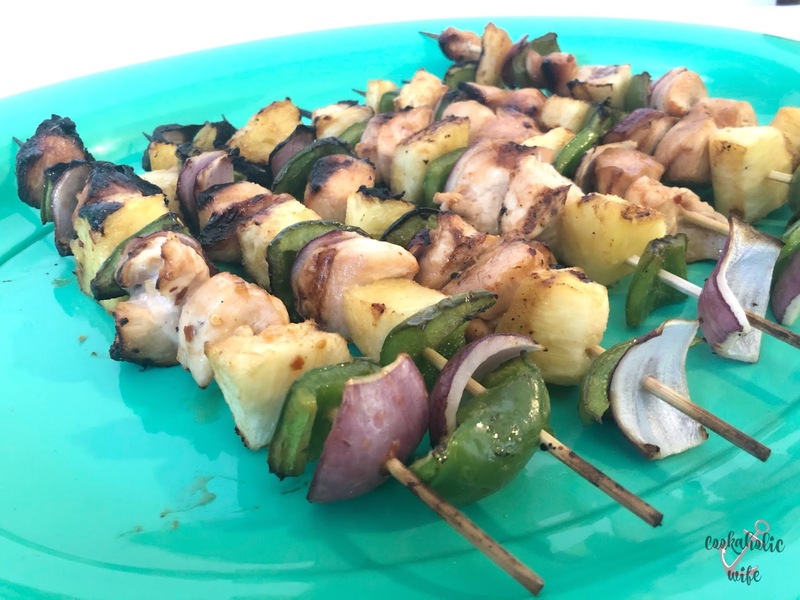 The chicken does need to marinate for at least an hour and if you are using wooden skewers, they need to soak for 30 minutes before going on the grill, so make sure to plan ahead with this recipe. The last thing you want is under seasoned chicken and burnt skewers messing up this delicious, easy to make dish! 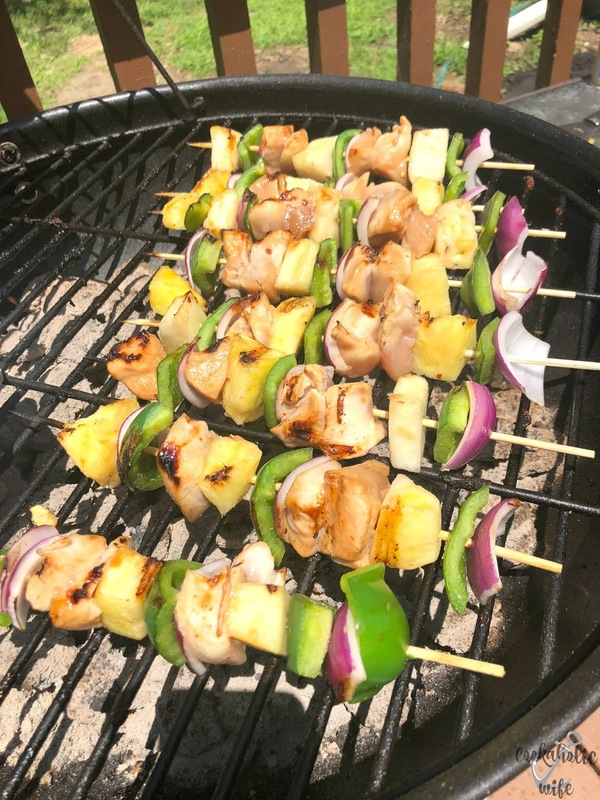 The perfect pairing of chicken, pineapple and bell peppers covered in a sweet and spicy marinade and grilled to perfection. 1. Combine the ingredients for the marinade and set half aside. 2. Place the cubed chicken into a sealable bag and pour half the marinade on top. Refrigerate for 1 hour, but up to overnight. 3. Soak 6-8 skewers in cold water for 30 minutes. 4. Heat the grill or grill pan to medium high heat, around 425 degrees. 5. 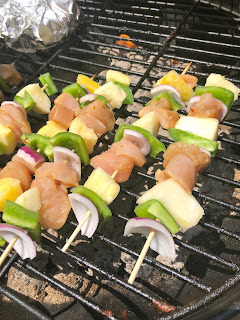 Alternate threading the onion, bell peppers, pineapple and chicken onto the skewers. 6. Grill the skewers for 5 minutes on each side, then baste with the reserved marinade and cook for 1-2 minutes more on each side. Serve immediately. If your family isn’t a fan of eating off a stick, after you grill these up, they are perfect served over a bed or rice or wrapped up in a tortilla to make Hawaiian chicken tacos. This is my last post for #CookoutWeek and the last chance you’ll have to enter the giveaway from my blog, so make sure that you do so today. Love the flavors in that marinade Nichole.